“This building proves once again that the Passive House Standard and good architecture are perfectly compatible”, says Professor Dr. Wolfgang Feist, director of the Passive House Institute. 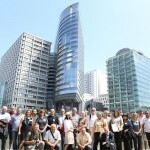 On Tuesday, an international group of Passive House experts who had travelled to Vienna for a Passive House Summer Academy, came to see the high-rise. 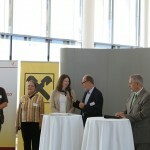 The building is strictly in line with the Raiffeisen climate protection objectives, explained Wolfgang Pundy as he received the certificate. “This certification proves that the path we have chosen to take for our new office building is the right one,” continued the project manager of the “RHW.2” tower. The building’s energy concept is compelling: energy is provided by a photovoltaic system as well as a combined heat, cooling and power plant. Even the waste heat from the data centre is re-used; cooling partly takes place via the Donaukanal. The decisive factor for achieving the Passive House Standard was the radically increased efficiency of the facade, the building component connections, the mechanical systems – and even the coffee machine. In combination with optimised shading equipment, the heating and cooling demand was reduced by 80% compared with conventional high-rise buildings. For quality assurance reasons, certification of buildings takes place in accordance with the criteria set out by the Passive House Institute. The globally recognised seal indicates compliance with the Passive House Standard. 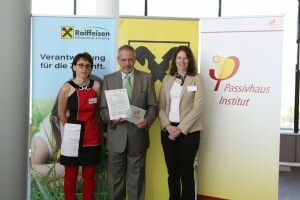 The Passive House Institute has been represented in Austria with its branch office in Innsbruck since 2010. After the awarding ceremony in the “RHW.2” tower, the international experts moved on to see other outstanding projects in the region. In Korneuburg, just north of Vienna, the group visited the new Regional and District Court with its adjacent correctional facilities. 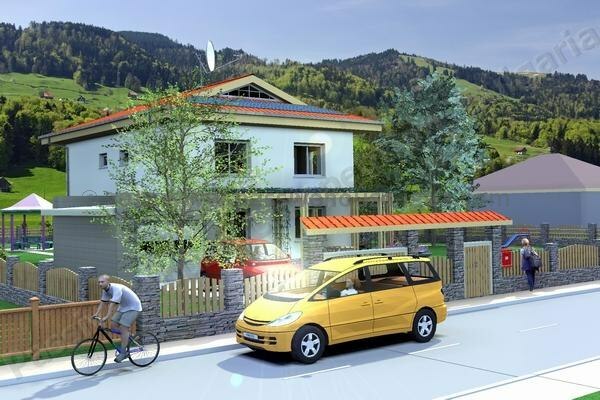 The building complex built to the Passive House Standard demonstrates how smart planning can accommodate the high levels of energy efficiency and comfort required in such buildings. The Vienna Region is setting the pace, not only with its beacon projects but also with the number of completed buildings. The “Eurogate” district, an area entirely consisting of Passive House buildings, stands as a shining example. Upon completion of the first construction phase, 7,000 occupants in 800 apartments will be able to benefit from the advantages of this energy efficient construction method. The international guests also viewed one of five Passive House student hostels, developed by the Viennese company OeAD-GmbH. A total of 15,000 students from all over the world have already had the opportunity to experience what modern and sustainable living means during their stays in Austria.